On January 9, 1963, the National Gallery of Art in Washington first displayed the “Mona Lisa,” if you’ve ever heard of it. 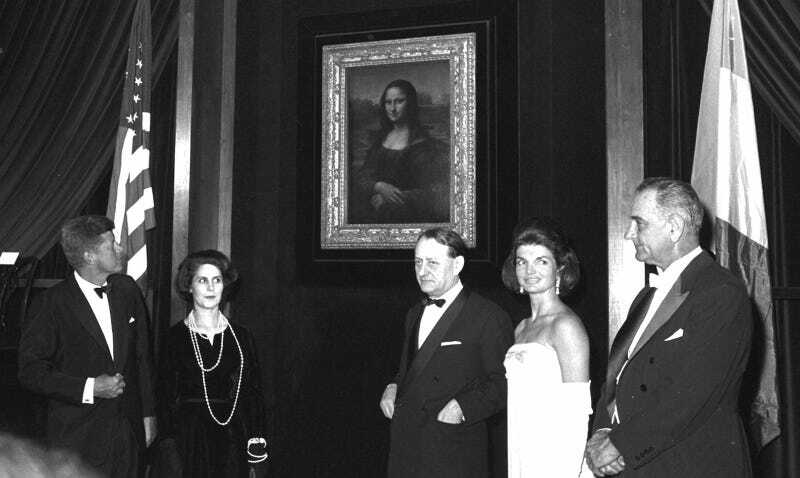 The painting had already been seen by a group of VIPs the night before, including Jacqueline Kennedy, who spearheaded the effort to get it to America. Leonardo da Vinci’s 16th-century masterpiece, the Mona Lisa or La Gioconda, had never been leant to a foreign nation before it visited the shores of the U.S. The History Channel did a piece on the loan in 2013, the 50th anniversary of its visit, and Kennedy’s work to make French president Charles de Gaulle loosen his grip on the cultural touchstone. In May of 1961, newly elected President Kennedy went with his wife to meet de Gaulle, meetings that allegedly did not go so well for him. Enter Jacqueline, a fluent French speaker, her charm supposedly able to soften France’s leader and its cultural minister, Andre Malraux. In August 1911, the painting had been stolen right off of the museum’s walls, in what’s been called the greatest art theft of the 20th century. For two years, a worldwide search turned up nothing. Finally, in 1913, Vincenzo Peruggia, a former employee of the museum, was arrested after trying to sell the painting to an art dealer in his native Italy. Peruggia claimed he had simply planned to return the painting to its rightful Italian home, but most historians believe he was involved in a far bigger conspiracy to sell a series of counterfeit versions of the Mona Lisa—passed off as the original—to unsuspecting buyers around the world. That wasn’t La Giaconda’s only close call. During both World War I and II the painting had to be spirited away to prevent it from falling into German hands. And just six years before the announcement of the loan to the United States, parts of the painting were damaged by two separate vandalism attacks, just months apart. The January 8 VIP opening was a roaring success—if that’s what you call an overwhelming shitshow. The New York Times reported the next day that the sound level was intense and the public address system was malfunctioning. Television lights made it difficult to see. Malraux appeared “shocked” and President Kennedy seemed “angry” that he had to shout above the noisemakers. The History Channel says that President Kennedy mentioned the “historic bonds between the two nations that stretched back to their respective revolutions—open, democratic revolutions” when thanking France, a reminder of the Cold War that had been intensifying since the Fall of 1962 with the Cuban Missile Crisis. I came to work a little before nine, dashed to the Western European Arts to study my gorgeous acquisition. Only to find that Murray Pease, the head of the conservation studio and his assistant Kate Lefferts, along with the officials from the Louvre in charge of the Leonardo portrait, were rushing around with towels. The security for the Mona Lisa was novel. The painting was set on an easel in the center of the storeroom with lights trained on it. Guards, taking shifts through the night, watched a black and white TV monitor outside the storeroom proper. No one ever discovered why but sometime during the night one of the fire sprinklers in the ceiling broke its glass ampoule and the masterpiece of painting and the masterwork of ivory carving had both been gently rained upon. It took me a minute to realize that the cross was moist but undamaged. The Mona Lisa, according to the Louvre official, was okay too. He told me that the thick glass covering it had acted like an effective “impermeable,” a handy dandy raincoat. The rainstorm was never mentioned to the outside world.